Borderlinx | Buy HSE24 and ship worldwide with Borderlinx. Cheap rates guaranteed. Home Shopping Europe 24 launched two decades ago as part of the U.S. Home Shopping Network. Today, HSE24 Germany online supports a multimedia presence that brings the convenience of home shopping into more than 38 million German, Austrian and Swiss households. HSE24 Germany is interactive shopping at its best. Customers get important product information and a more realistic shopping experience via TV and web streams, and then log on to purchase on their own schedule. With an HSE24 Germany product line of more than 20,000 items annually, there's truly something for everyone. Independent, savvy women love the ease and convenience of HSE24 Germany home shopping and how fun and affordable it is to treat themselves and their loved ones with great HSE24 Germany deals. Enjoy a wide variety of exclusive products at excellent savings, and take advantage of numerous promotions for limited stock while it lasts. The range of HSE 24 Germany product offerings seems limitless, covering fashion, beauty and wellness, jewelry, home and living, household items and DIY products. Quality, reliability and superior customer service round out this awesome shopping experience. 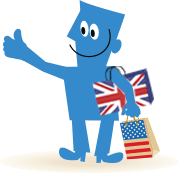 Savvy shoppers around the world can now buy from HSE24 Germany through the great benefits offered by Borderlinx. Learn how easily Borderlinx works and check out how inexpensive it is with our shipping cost calculator. Then, start shopping! A number of services are available through Borderlinx to make international ordering from HSE24 Germany hassle-free, including shipment value protection, free repacking and consolidation services.